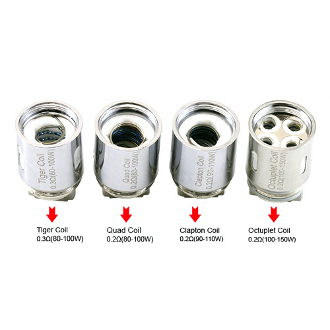 All the DUOS Replacement Coils are a perfect match for your Duos Sub ohm tank. Each coil comes with its own features and wattage specifications but all of them are built with prime organic cotton to soak up your e liquid and deliver non stop flavor. The Tiger Coil has a vertical orientation with a twisted flat wire and is rated between 80-100 watts. The Quad Coil also has a vertical orientation but with a quad parallel wire and again also has a 80-100 watts rating. The Clapton coil is vertical orientated with a single clapton wire but a slight higher wattage of 90-110 watts. The Octuplet is has a vertical orientation with quad parallel wires and the highest rating of 100-150 watts!